A smoky Glenturret… at cask strength… wha…?! You bet. 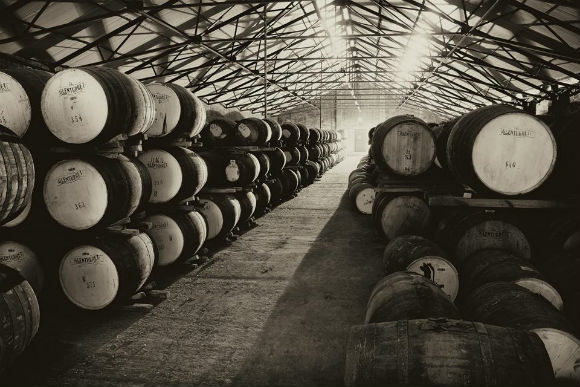 The ‘Peated Drummond Edition’ takes its name from the distillery founders, John and Hugh Drummond, who signed an agreement in 1775(ish) with the neighbouring Ochtertyre estate in order to be able to use the estate’s peat in order to dry the distillery’s barley. This whisky was distilled in March 2009, making it 8 years old, and it’s bottled at a cask strength of 58.9%. It’s only available at the distillery, and all 315 bottles from cask #100 have been hand signed by new distillery manager Ian Renwick. But that price tag though… £145. Oft. Nose: Sweet, aromatic smoke, burnt heather, porridge, oatmeal and some honey on granola. A little spirit too – a hint of tart fruits and gooseberries – then there’s bourbon biscuits and slightly burnt caramel. Palate: Big, drying peat smoke, ash, charred wood and bonfire embers. It’s not shy! Underneath, the fruit cleans things up with green apples, unripe pears, and lemon peel. There’s a savoury side to it too, with some charred steak covered in cloves. Finish: Lingering woodsmoke with a bit of lapsang souchong tea. Overall: A very satisfying dram. I like the big, aromatic, smoky hit along with the green fruits and savoury spice. It’s (unsurprisingly) a bit young in places, and the price tag is eyewateringly high in that regard. Other distillery exclusive bottlings are available at half the price for twice the age, and, in my opinion, offer far better value for money. Don’t get me wrong though, based purely on the liquid, this is very tasty stuff. This entry was posted	on Thursday, December 14th, 2017 at 9:57 am	and is filed under Reviews. You can follow any responses to this entry through the RSS 2.0 feed. Responses are currently closed, but you can trackback from your own site.